Shaken Baby Syndrome, also known as abusive head trauma (AHT), is the name given to a range of conditions caused when a baby is violently shaken, suffering brain damage and, in the most severe cases, it can prove fatal. It’s difficult to accurately estimate the number of babies which suffer from shaken baby syndrome but experts say that 2 or 3 children under 2, out of every 100,000, could be shaken at least once by a parent. professionals about shaken baby syndrome. 3B Scientific’s realistic Shaken Baby Demonstration simulator certainly fits this brief. 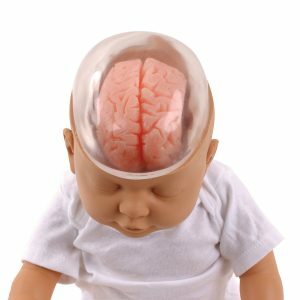 The realistic infant manikin has a transparent skull covering, allowing parents to observe a baby being shaken, the effect on the brain and then to see the results after shaking the simulator-baby themselves. It’s a demonstration that few people will ever forget! When it comes to doctors and other medical professionals spotting a baby which has potentially been shaken, different types of training might be required. Demonstrations with simulators will keep the possibility of shaken baby syndrome at the forefront of medics’ minds and the syndrome can be diagnosed using a combination of MRI scans, eye examinations and blood tests. Often, the damage to the brain caused by violent shaking is irreversible but treatment might include support for breathing and surgery to treat bleeding on the brain. Training in First Aid for Babies and Toddlers – Who should be trained? People who spend all day working with very sick or premature babies are the experts when it comes to dealing with a choking infant or performing CPR on a toddler. They will have received extensive training in first aid for babies and toddlers and have practiced their skills dozens of times. Healthcare professionals who work in other fields of medicine might find their skills a bit rusty though and for first time parents, the responsibility of taking a tiny baby home can be overwhelming. Pediatric first aid lessons are of great benefit for everyone working with children – experts agree that the best type of training is when you can be taught a technique and then immediately put it into practice. One of the main techniques which is taught through first aid classes is CPR. This is one area where practical teaching is essential. 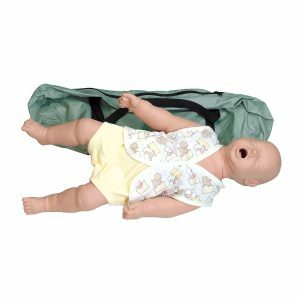 Healthcare professionals might know the theory of resuscitating a baby but should still be given the opportunity to practice on a realistic simulator and make sure that their technique is effective. For people who have never done any sort of CPR training before, they can be taught what to do and immediately progress to the simulator, trying again and again until their technique is perfect. The other main health emergency which affects young children is choking, which is one of the four leading causes of death in children under the age of 4. It’s particularly an issue when kids start crawling, walking and investigating their environment. It’s not just food which children can choke on, it’s little pieces of plastic, toys or clothing too. Education about minimising choking risks is the starting point in addressing the choking risk but again training on a simulator is a valuable extra learning experience. In order to dislodge something in a choking child’s throat, parents need to be able to experience how hard the blows between the shoulder blades have to be to dislodge the foreign body and different sized simulators will allow participants in a training course to practice on babies, older children and adults, all in one training session. How confident are you in your own ability to save the life of a child in a medical emergency? Would you know how to spot the signs of traumatic injury in a baby? Enrol in your nearest first aid classes to acquire new life-saving skills and refresh older procedures with new techniques. 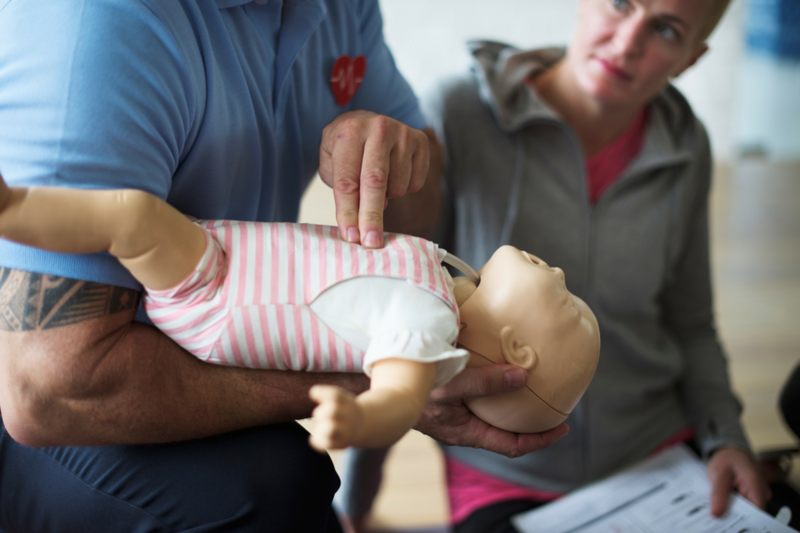 If you’ve taken part in a training in first aid for babies and toddlers recently we’d love to hear from you. Share your experiences with us in the comments below and get in touch via our social media networks.